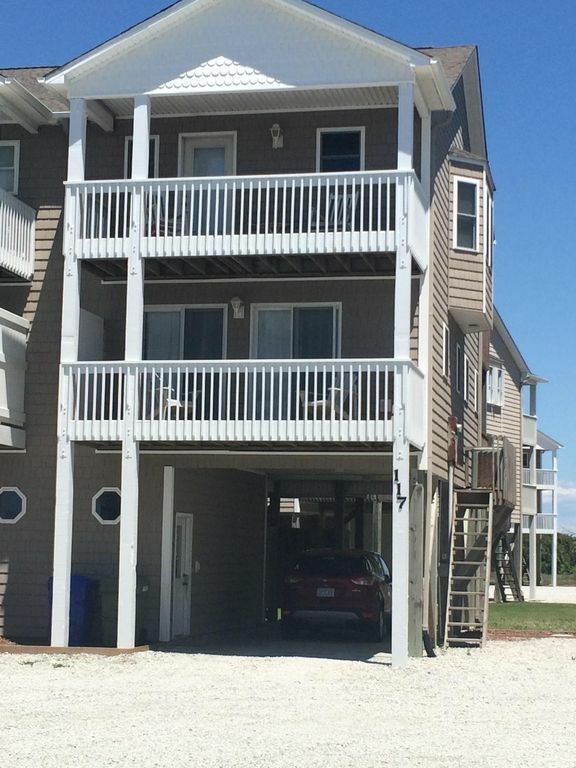 Right-side, 2nd Row duplex with fabulous views from all 4 decks. Beach access about 100 feet away. 1600 Square feet, 3 bedrooms plus a sun room that can be used as a bedroom, and 3 full bathrooms. Sleeps up to 11. Reverse floor plan—the top floor has a tons of windows with great views, a fully equipped kitchen, large dining area that seats at least 10, living room, a sunroom, great decks with ocean and sound views, and a full bath with a shower. A 37” Flat-screen HDTV with Cable TV, DVD/VCR, stereo, Wii system with games, board and card games, and books are all available for your entertainment. Wireless Internet access is also provided! Downstairs the Master Suite has a King size Sleep Number bed, a private bath with Jacuzzi tub and shower, private deck, and TV/VCR, also with Cable TV. The 2nd bedroom has a Twin over Full Bunk Bed and deck with ocean and sound views. The 3rd bedroom has a Queen bed and deck with ocean and sound views. A full bathroom and laundry room with washer/dryer are also on this floor. Other perks include Dual-Zone AC, ceiling fans throughout, an outside enclosed shower, a wheeled beach cart, and an outside locking storage area with floats and chairs for guest's use. There's also a card table and folding chairs for extra seating. Beds: King, Queen, Twin over Full bunk, Queen Sofa Sleeper in living room (sleeps 3), queen Futon in sunroom. FLEXIBLE BOOKING AVAILABLE! MINIMUM 4 NIGHTS OFF- AND MID-SEASON, 7 NIGHTS HIGH SEASON! We love to come to North Topsail, our "home away from home". Beautiful beach, friendly and laid-back atmosphere, and a totally relaxing place to be. North Topsail Beach is a great, family-friendly beach, with shopping and golf courses close by, good places to eat, not too crowded on the beach. We love to walk on the beach, fish off the pier, enjoy the friendly community, visit the Turtle Hospital, rent Kayaks - the fun goes on and on! Sitting on the decks overlooking the ocean, watching the sun set over the back decks, long walks on the beach, relaxing in the jacuzzi tub in the evening. View of the beach from top decks. Fully equipped kitchen with toaster oven, pots and pans, dishes, coffeemaker, blender. Big table that expands to seat 10. Card table and extra chairs in house for extra seating too. (2) TV in Great Room and in Master Bedroom. What a great rental! Mrs. Crisp was vary accommodating to all of our needs. The house was exactly like stated in VRBO. The beds were very comfy, plenty of games in the closet and a fully stocked kitchen with any utensil we may have needed. The location was perfect, the beach access was right across the street and town/Camp Lejeune was just a short drive for us. Thank you so much Mrs.Crisp for everything! Went over Christmas vacation and had a wonderful time... beach was not crowded! We had 6 adults and 7 children under the age of 5 and it was a little tight getting everyone situated but was doable! Host answered every question via text rapidly and was very reliable! Highly recommend this place for your next vacation! Thanks so much for the feedback. We try to be as responsive as possible, to ensure you have a pleasant stay. Please think of us if you return to NTB! Thank you so much for your kind comments. I hope you will think of us if you come back to NTB! We really enjoyed our stay, everything was as described and location was perfect. The house was clean, comfortable, and spacious. We loved the location and all the great views. We would definitely stay again! Location fabulous. We had everything we needed. Great job on labeling. Spacious. Great views from numerous decks. Owner fabulous to work with. Carpet and sofa showing wear.